Even non-Christian religions do it. Let’s do it. Let’s evangelize and disciple on the basis of something better (and more biblical) than a personal relationship with Jesus. When Christians evangelize and disciple on the basis of inviting people to a personal relationship with Jesus, not only do we undermine the fundamentally corporate nature of our relationship to God that is portrayed in the Scriptures, but we also inadvertently, grievously construe church as a stumbling block in our “personal” relationship with God. Churches have talked about needing to have a personal relationship with Jesus Christ — what you hear is, ‘I need a relationship, I need to be born again,’ but not, ‘I need to be involved in a congregation.’ Guess what? That’s where we are. We know that we have passed out of death into life, because we love the brothers. Instead, it is because just as your family is at the center of your heart, God’s family is at the center of his. A family in which the children have personal relationships with the father but no relationships with each other is not a very good family, as I can personally attest from my experience with my birth family. Instead, a very good family is one where all the members enjoy rich, deep, full, loving, caring relationships with each other, according to the rules of the house laid out by the father. 20 “I do not ask for these only, but also for those who will believe in me through their word,21 that they may all be one, just as you, Father, are in me, and I in you, that they also may be in us, so that the world may believe that you have sent me. 22 The glory that you have given me I have given to them, that they may be one even as we are one, 23 I in them and you in me, that they may become perfectly one, so that the world may know that you sent me and loved them even as you loved me. With apologies to Dale Jones, the moment we talk about the necessity and importance of congregational participation, we’ve officially missed the point. We’re not born again into a congregation. We’re born again into a family. That this is such a straightforward and noncontroversial and basic proposition biblically is undermined by the dearth of evangelical Christian websites out there that address the topic. Grievously, there are scores of cult sites that focus on the family-of-Christ nature of God’s design, and, as Jones’ comment attests, the religions that stress the corporate nature of faith are thriving these days, even (perhaps especially) in our individualistic age. Even book clubs promote book reading as a group activity; that is, participants read and grapple with contents in light of their relationship with the club as a whole. But in an eerie twist of church history, evangelical evangelism strategies have perfectly de-emphasized the inescapably familial nature of the Christian life, omitting its mention completely from, for example, the Sinner’s Prayer and day-to-day church life. Church is often portrayed as a non-hierarchical association of believers rather than brothers and sisters joined at the hip by a praying Jesus. And if that’s true of earthly families, how much more so of our heavenly one. 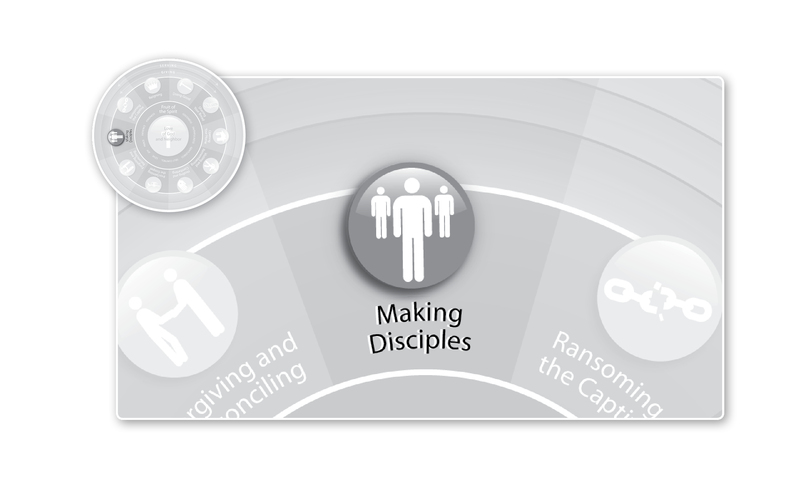 Which is all the more reason why our evangelism and discipleship strategies must not only be ones where we teach everyone to obey the commands of Christ in an accountability framework; they must be ones where we understand that we are being obedient to our Father in a family of many brothers and sisters. Perhaps at our evangelistic rallies we should call people forward to the Gaither’s Family of God rather than that other old classic, Just As I Am. This entry was posted in Making Disciples and tagged Making Disciples, personal relationship with Jesus, sinner's prayer, Work of Mercy. Bookmark the permalink. Eric, your stuff is always mind-blowing in terms of giving me new insights, and especially drawing me back to “under-noticed” and important concepts in the Word. Rock on, Brother! We’re doin’ it, man! Good to hear from you, Mark. Heavenly family is something I do not understand, Pastor Foley. And I will continue to read, pray, study and ask God until it is understood.